If you haven't heard the buzz about New Music in Bryant Park, you haven't been paying attention! Last week's performance featuring JACK Quartet received a wonderful review in the New York Times. Tomorrow's performance by Grammy-nominated and Bryant Park favorite Imani Winds will continue the series' momentum. Imani Winds will perform its commissioned work "Zafir," which means "gentle breath" in Arabic. Combining European classical traditions and the sounds of the Middle East, America's premiere wind quintet will take the audience on a cross-continent musical journey. To prepare for the piece, the group learned the microtonal scales and rhythm structures of Upper Egypt, where the musical journey begins. The second half of the piece transitions to a unified expression from the ensemble, followed by an improvisatory section that builds to a rising climax. Imani Winds will perform additional pieces with an international flair. "Tziagane" takes inspiration from both Palestinian and Gypsy music; "Andaluza" originates in Moorish-influenced southern Spain; "The Lotus Pond" exemplifies the heart of the Arabic language; "Quintet No. 2," by Uruguayan composer Miguel del Aguila, uses harmony and melody to write with musical color; "Dance Mediterranea" evokes sunny villages on either side of the Mediterranean. The opportunity to travel across the world with one of America's premiere wind quintets--without having to find your passport--is one you won't want to miss! 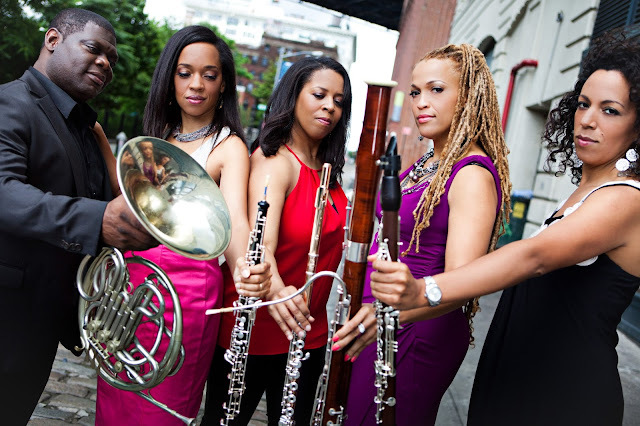 Imani Winds, one of the country's premiere wind quintets, performs tomorrow at Bryant Park. All pieces in the New Music in Bryant Park series are commissioned by Chamber Music America. Funding for the CMA's commissioning programs is provided by the Andrew W. Mellon Foundation and the Doris Duke Charitable Foundation.